ES tested 906 (907.25 to be exact), TF had a spike almost hitting 500 to then reach stall level again. One could now be led to think that markets should start taking short term profits again on top of the trading range (Fib pattern already visible with the same target on key 500 level). There is nevertheless still some potential to aim a little higher first. 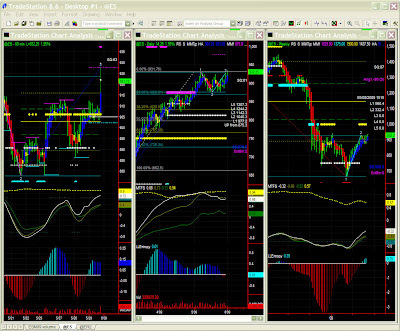 We therefore change our immediate scenario for 926-930 target (Fib level) on the 60mins chart. We are still in a configuration eventually pointing towards a pivot point and a return to ~900 but we have to admit selling pressure is very low right now. Today we'll watch out for a possible channel breakout on the 60mins chart, otherwise wait for the next pivot in the 926 area. On TF, it seems that it may unconvincingly reach 512 (or 516?) but we first have to wait patiently for that next pivot to be confirmed and to align with our longer term scenario. My 2-cents for the day are again not to read between the bars. The bearish Fib pattern is starting to show, the weekly chart is ready to fall, but the 60mins charts shows positive energy still, so patience is always a virtue. Not only 906 was passed fairly easily (see yesterday's report), but the pattern has now crystallized for a target either around current highs (~920) or more likely mid to high 920s (~927). This does not change our longer term scenario even if retracement potential now looks reduced of course. 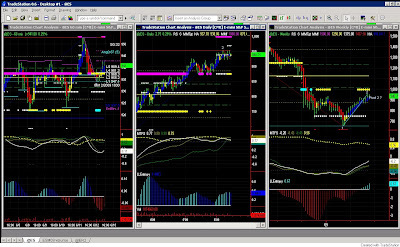 We'll therefore watch the daily range carefully, and particularly Support/Resistances and Fib levels. TF follows the exact same path and therefore does not provide any any extra information to help us here. So we'll have to go through this upward retracement first, and wait for the next pivot to be confirmed. Again, the most likely route is a return to the consolidation even if selling pressure has diminished substantially. The soft landing mentioned previously turned into a sudden upward retracement (with a sizeable overnight gap) to test key levels broken earlier (906 for ES and 500 for TF). It iw quite normal to see them being tested as resistance now, so nothing surprising as such. The 60mins chart is however hesitant (reached a Fib PR2 on 908.5), so we'll have to watch this 906 level very carefully. Would there be no overnight spurt of energy, one would say that this is normal level testing, notmal range trading, and the overall trend toward consolidation would resume shortly. That scenario is still more than valid on the daily chart, but this volatility on shorter time frames is of concern and one cannot discard moving up one price segment again in the next couple of days. Despite this high volatility, we'll nonetheless stick to our consolidation outlook provided by our daily and weekly charts. 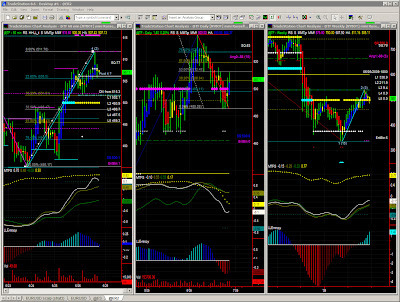 The 60mins chart shows ES sitting on the 2nd FIB target with no visible intention to drift lower for now. It should however settle lower after a while. The daily chart is still on its way for that lower consolidation level as mentioned in the weekly report. Same for TF, currently in between Fib levels, aiming slowly but surely to 480, 467 to probably 459. Buyers should come back to the charge somewhere in that area. We had anticipated this move on several occasions, even if it is never too easy to pinpoint when the breakout will actually occur. It was therefore a clear case for a stop entry just below support levels or simply follow the last pivot and enter limit or on some pivot confirmation. ES went almost straight to the target we gave yesterday (2nd Fib expansion level) and should aim at stall level in the low 880s but some soft landing is possible in the short term. The daily chart points lower though, so any bounce on the 60mins chart is likely to be short-lived. Note that on all time frames, an absolute bottom would be around 840, i.e. we do not revise our longer term scenario described in previous reports to see ES test 968 then 1000 within a month or two. TF also shows a soft landing area around current lows, so shall we see 500 tested as a resistance again to then aim lower ? Like for ES, a longer term consolidation target is probably in the 460s where buying would resume in concert with ES. Last week's reports were pretty much on the mark. Let's see whether our charts still provide some clarity going forward. ES on the 60mins chart has only moderately crept higher from the 906 support level and seems ranged bound with a resistance in the low to mid 920s. The situation is relatively unstable so while we should take higher lows seriously, this late rise remains too weak for our liking. Having said that, a burst of energy is always possible if range highs (around 930) are broken. The daily chart expresses the same concern as last week, whereby one could still see some retracement to a lower support level before attacking the major 968 / 1000 levels. That support level could be in the 880s, or maybe back to the 875 pivot level. The market definitely needs a consolidation after such a strong rise since March lows. It however difficult to estimate when portfolio managers will do their window dressing ahead of end of quarter reporting. This could trigger some substantial selling. Note that even the weekly chart with a very high entropy level is "ripe" for a retracement (840 ?). The situation is about the same on TF, and we can keep an eye on the 500 level as a signal for the anticipated retracement. One cannot however discard an alternative possibility of seeing the bearish pressure dissipate over time on such strong support level (looks unlikely though). Again, at the moment there is no indication that the still hypothetical pullback would be more than a pause toward the 600 / 625 levels in the medium term, but at the same time, our charts hardly ever give us more than a few weeks visibility. There will be daily updates this week still, then we will slow down to a mid week report during July/August unless market activity warrants more coverage like for the last 2 years. One should probably not pay too much attention to current "noise" on ES. We indeed have some conflicting forces, with a first drive to try and reach 920, in a kind of a short term air-hole. We should indeed see ES fall toward the 880s in the coming days. 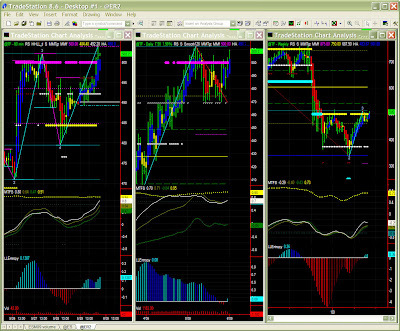 TF shows the same pattern with a possible short term target in the low 510s. The underlying scenario remains the same with an anticipated consolidation then an attack at strong psychological levels (968/1000 for ES and 600/625 for TF). More details in the forthcoming weekly report. Again, we see this kind of soft landing on 906 for ES and 500 on TF as one possible jumping board to aim at our targets (respectively 968/1000 and 600/625). However, as mentioned already, there is a substantial chance of markets gathering strength on lower levels (1 price segment). In either case, selling pressure is still there at least for a few days to a week. We may see some increased volatility on derivatives expiration, so we'll probably have a clearer view early next week. 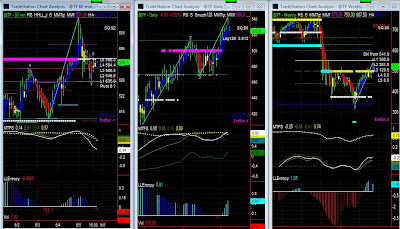 Markets behaved as expected yesterday with ES hitting target on 906 and TF on 500. A momentary bounce is possible in the short term and one cannot forget that this is only healthy profit-taking on the daily chart. These levels are strong support levels on both time frames so we probably just have to exhaust the current selling pressure. One cannot discard the possibility of this level being broken and lose another 5% or so (quite a likely scenario actually). Again no reason to believe that this is anything more than a normal pause to gather strength and attack the 1000 level. We were right in anticipating "turbulences" and watch out for that key 937 level. I thought the low 920s would hold, but ES might actually drift slowly further to 906 now. Likewise, TF will probably test 500 later on this week, even if it could also rise to 515 first. TF indeed certainly indicates clearly that buying pressure is dissipating a little in the short term, while being now in a [500-516] price segment, i.e. one step down from the previous [516-531] trading range. On the longer term markets are probably just looking for a base to attack 1000 for ES and 600 to 625 for TF, so again, one should expect a major reversal here. The market again showed remarkable resilience last week. 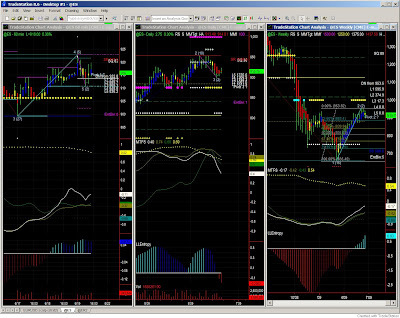 ES tested the 950s as expected only to retrace to the 937 area which still acts as a pivot level. We're coming close to the end of the ESM09 contract which has been quite bullish since March. 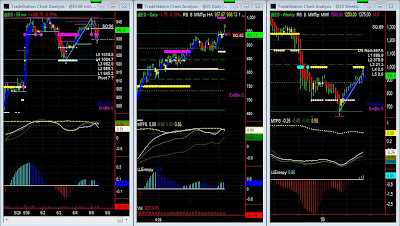 Both 60min charts on ES and TF show low SQ (swing quality) level hence, one chould take cues from the daily chart and eventually trade a lower time frame (< 30 mins). The daily chart is again clearly overbought and bullish, indicating some turbulences and possibly some retracement ahead of the stall level (high 960s). Such bullishness and forthcoming turbulences are also particularly visible on the Daily MTFS with the white line crossing the green line. As described many times on the TS-T-T blog, this is called a "early crossover" which can hardly stop ES from marching ahead to the otherwise overly anticipated 1000 level. We'll therefore watch out cautiously the stall level first (~968), and a likely retracement back to the low 920s, which is a Fib retracement level on the daily chart and the low of the trading range on the 60mins chart. In the very short term, Friday's bounce on the 937 pivot level is also a a sign for a higher support level, which means that any retracement potential should remain minimal. We'll notice a Fib retracement level in the low 920s which coincide with lows of the trading range on the 60mins chart. We certainly can't discard some substantial volatility on triple witching week so we'll watch out for this key level to see which scenario develops (968 or 920 ?). Lastly, if we take a look at TF for possible discordances, we do notice that the daily chart has reached its first Fib target level which could trigger some selling to now test the 500 level for support. No such sign in the short term though, so again, we'll need to update our scenario as we get closer to futures and options expiration. Quick note (n between flights at the airport) just to say that we may have a retracement point now that we've reached the 950s level. Check Fib levels from current highs, but do not expect a retracement below 875 unless this new emerging pattern is confirmed. More to come this weekend. Is it really worth writing a few lines today... ? We see that same continuation of the trading range we've seen for about a week, with a potential breakout to the next price segment. We would then have a target in the high 960s. We also notice a reduction of the price range on the daily chart, confiming that any retracement would probably be limited. Again, the whole point is to know where and when this bull run will stop. Short term call spreads just above 1000 are pretty safe. NOTE: I will try and post a report tomorrow in between flights, even though one should not expect any "shock in the system" (some economic news today still...). As mentioned above, markets should just creep a little higher, so tomorrow's report may not be needed after all. Same trading range and same hesitation with that same underlying bullishness. 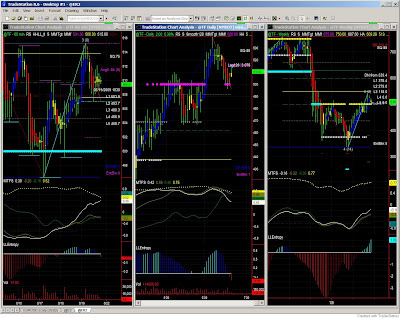 ES levels have now moved up one notch, with a target around 950 to 953. We're still unsure whether we'll see the market give a go at 1000 before retracing. The daily chart indeed tends to suggest a pause if not a retracement once range highs are hit again. TF could be aiming back at range highs but shows even less inclination to go straight to the 600. A retracement is quite likely to gather forces for the assault of the 600 / 625 levels. Market is still very much hesitant. We've seen ES almost testing range lows as mentioned yesterday, but finally still hovering around that same key 937 level. A breakout is possible, which would postpone the otherwise necessary retracement. Again the daily chart is still very pushy, so shall we see the market jump to the next price segment ? TF is again somewhat less bullish right now, but longer term traders can safely aim for a higher price target. 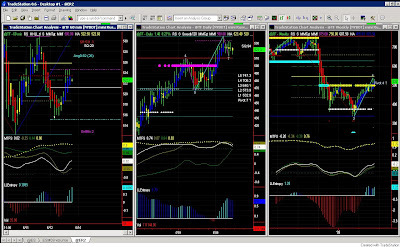 ES is still overbought and bullish, stuck on the 937.5 level, last obstacle to the 1000 level. While a retracement is still possible, a breakout on the up side is now more probable. The question now is: Shall we see that 937 pivot level being tested as a new support to go higher ? ES (60mins) retraced to bounce on Fib Pr1 and MM level. 937 is still pretty strong and actually is a stall level at daily level. Is this going to be the signal for the awaited retracement ? Difficult to say. As always, we want to avoid reading too much "between the bars" so we'll check the 937 level carefully. Same story on TF. As mentioned previously, we had to realize that markets had to align and 531 is now the key level here. No reason to be contrarian though. Let's go with the flow for the time being, even if a "air hole" starts showing on the daily chart. More details on the next weekly report. My PC was stolen last night, in this wonderful city of Cape Town, SOUTH AFRICA. I'm going to try and get a backup PC going some time today. At best, today's report will be quite late. ES and TF indeed broke out on the upside, ES reaching the top of the trading range in a quantum leap we've discussed before. TF understandably "heavier", went the same way, but was stopped on stall level. A moderate retracement is possible at this level since 937 is a strong resistance level on both the 60mins and Daily charts. Markets are very bullish and overbought but a retracement from highs is likely to be limited and possibly test the low 920s (previous highs of the trading range which just broke out). 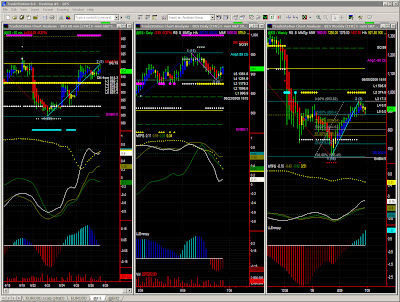 TF paused on stall level but shows little inclination to retrace still. Difficult to say whether it will attempt to reach 530 or gather forces on Fib PR1 just above 500, but there is probably enough momentum left in the market to aim a little higher. Here is the month of June, a summer break in sight for those who can afford one, and maybe time to relax soon, to take a step back and look at these mad markets again... Does anyone know where markets will be Dec 31st ? No the slightest idea, i'm afraid. ES is definitely trying to breakout on the up side, the 60mins chart is quite bullish with a target just above 930 then 937. Breaking the daily highs would certainly open the way to the almighty 1000. Again we have no such evidence on our charts, and while this may look like stubbornly contrarian, the chances of retracement are still substantial. If we now take cues from TF, this 500 level is certainly crucial and could certainly give is the market direction at least for the next few weeks. It has been penetrated, but is still valid. We can't ignore ignore that we have a Fib target around 541 hence a strong breakout potential here too. The 60mins chart is here also very bullish, and we also have a lid just above 500 containing prices for the time being. ER and ES have now aligned on their respective resistance levels and could congest or breakout in concert. The GM announcement today may have a bullet effect either way. If we stick with our "go with the flow" method, our scenario for the week will remain: congestion (daily) with a strong upside breakout potential (60mins).